If George Clinton needs a personal electric mothership to land during "Cosmic Slop," he can call Mercedes-Benz. 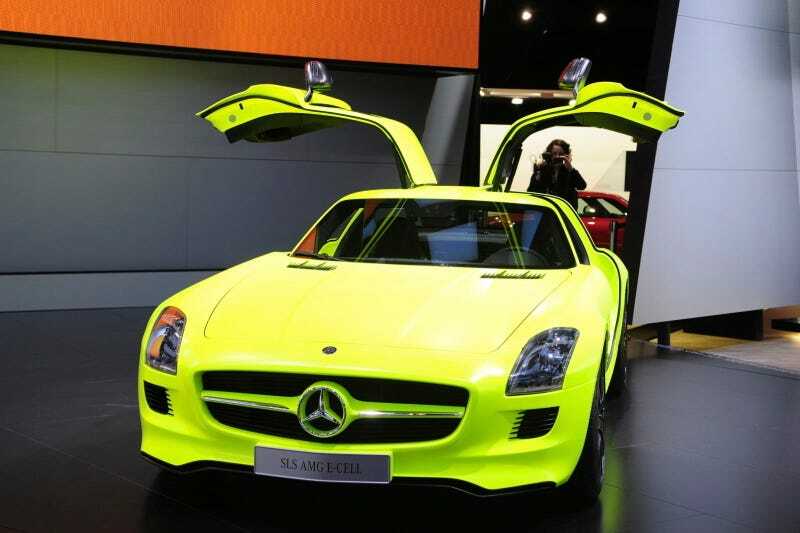 This psychedelically-colored matte-finished SLS AMG E-Cell enters series production in 2013. A new theme song, "Make My Cell the E-Cell," practically writes itself. Here in Detroit, Mercedes announced (again) that the electric version of the SLS—producing 526 hp and 629 lb-ft by way of wheel-hub electric motors—will hit dealerships in two years. It'll gain a bit of weight from the gasoline model by way of a 400-lb lithium-ion battery. And that color? It's called "AMG Lumilectric Mango," long the fruit of choice for bass-playing members of the afro-alien diaspora.